THANK YOU FOR MAKING DESIGNER CON 2014 A SMASHING SUCCESS! This year, Designer Con topped all previous efforts with 330 vendors, 73,000 square feet of toys and art, and over 7,000 attendees! MARK YOUR CALENDARS! 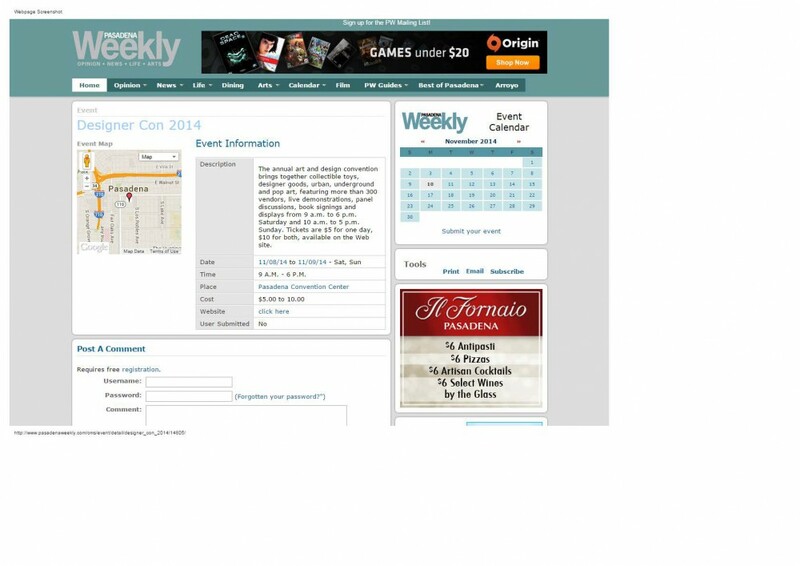 DESIGNER CON 2015 DATES SET FOR NOVEMBER 21 AND 22! at the Pasadena Convention Center, Exhibit Hall. STAY TUNED FOR DESIGNER CON 2015 INFORMATION! Designer Con is where imagination and art overwhelm your inner child! Love the show!! SO many talented artists and toy makers- I really enjoyed being a part of it. I do 30-40 shows a year and really look forward to this one because of the environment; non commercial, artist focused, and tightly run- easily one of our best shows. I can see why the attendees come back year after year- I know I will. Unlike most conventions where many vendors and exhibitors have basically the same stuff, each and every booth at Designer Con is unique. Ever aisle offers something new and exciting and you’re guaranteed to find something you never realized you had to have. – Jeremy Sung, Spy Monkey Creations Inc. There is no show like Designer Con! I’ve never seen so much variety of talent in one convention and attendees definitely appreciate this. DCon is also one of the most wonderfully managed shows I have ever sold at. This is definitely one I will be adding to my circuit. Absolutely love this show, we need more like it. The cross over between graphic illustration and hand made design is a brilliant idea that fills a much needed void in the pop culture convention world. If you are an artist or company in the designer toy scene or pop-art world, then you NEED to make the trip to Designer Con to show your products and art. It’s a very well run event and THE place to be to showcase what you do to the most fans of toys and art possible. It’s an affordable event and tons of fun. I’ve networked with many talented people and made a lot of friends while doing so! Designer Con is seriously at the top of my list now. I loved that the focus is on original designs and art, not fan art and costumes. It’s not crazy crowded, the people are super laid back and friendly, and it’s just a nice experience all around. I came home with a bunch of new art and tons of new inspiration, I can’t wait to go back next year! One of the greatest events ever. The landscape is changing but the event is something that is inspiring and will ultimately help everyone. This convention addresses all our needs from feedback, inspiration, market testing, and plain old friendships.